I wanted to start off my October Horror movie Challenge right. I wanted something with a good actor and a pedigree. 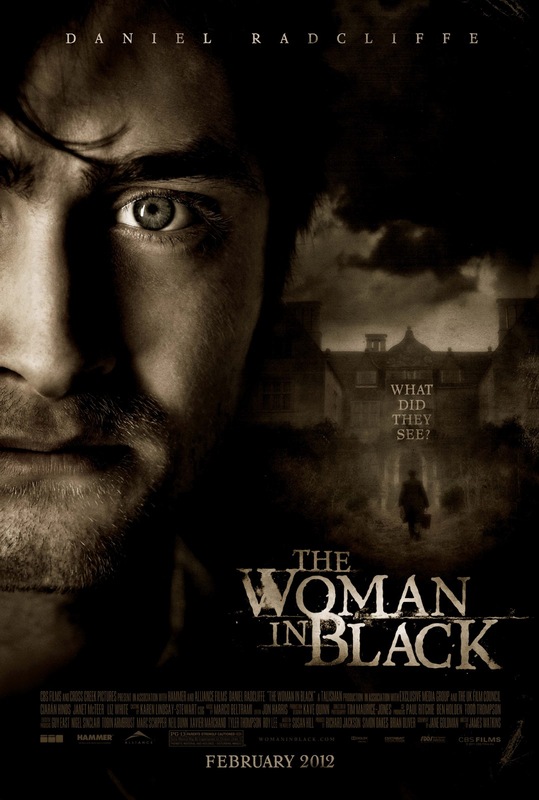 I choose the 2012 version of The Woman in Black. Starring Daniel Radcliffe and Ciarán Hinds (good actors) from Hammer Films (pedigree). I am never sure how much to put into these reviews. They are not reviews in the fullest sense but I think recapping the entire movie would be a bad thing for others participating in this Challenge. I don't want to spoil the ending for anyone. So I will say this. Daniel Radcliffe never once reminded me in word or deed that he was Harry Potter in this. He is a great actor and has a great carrier a head of him. I went into this film expecting only a nice period piece haunted house movie and that is what I got. The story is one we have all seen dozens, if not hundreds, of times before, but that did not make it less enjoyable. On the contrary I rather enjoyed this movie a lot. It also goes to show you that there is no such thing as a simple ghost story. Not that the movie is perfect either, it had it's own issues. But all in all this is a great start to the Halloween season. I was also surprised by how much I enjoyed this movie. And I agree that Daniel Radcliffe is a great actor. I think he has a long and successful career ahead of him. I just watched this Sunday. I thought it was very well done. I thought that the Edwardian costuming and set was most excellent and it had an appropriately spooky feel. My wife and I went to see this in the theater, as we loved the classic Hammer Horror films. We were both very pleasantly surprised; it was quite good, an excellent relaunch for Hammer. I think the best thing about it was it was understated; they weren't looking to make a blockbuster, they were looking to make a good movie. And they more than succeeded... they made a relaly good, almost great movie. I enjoyed it. The filming and design were especially well done but, overall, I think I prefer the stage play. I enjoyed it but I wanted to love it. However, one little detail that I didn't notice has made me re-evaluate my opinion of the movie and I suspect that future rewatches will see this going up in my estimation. I just think that it's a shame that it seemed to be nothing more than a number of jump scares as I didn't feel any real atmosphere oozing from the screen, despite the lovely sets and design.